A low wooden white fence surrounds the front yard of the old house on a quiet street in picturesque Wallingford. It is painted light blue and has a few accents of red around the window trimmings. The pitched roofs and bay window are typical of Seattle residences built in the early 20th century — according to the property records, this one dates from 1916. The neighboring house, which sits on a parcel half the size, is angular, boxy and surrounded by a taller wooden fence. 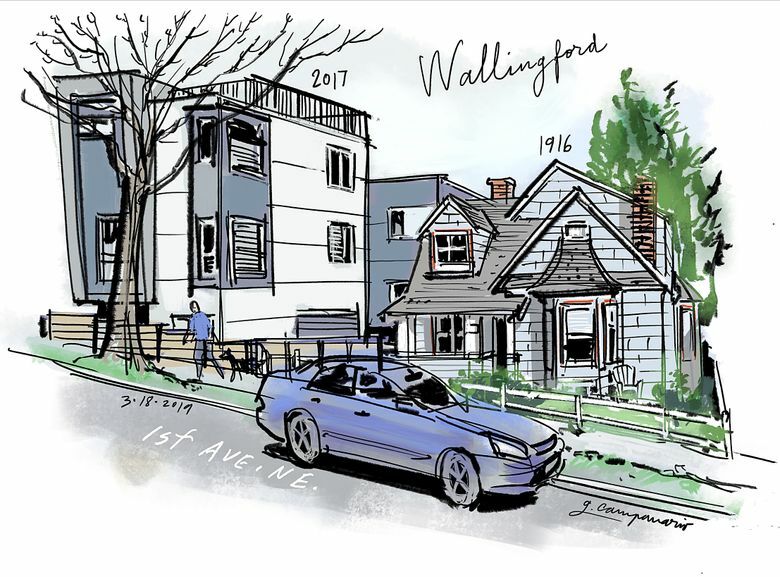 There’s stark contrast between this pair of Wallingford residences that recently caught my eye, but wouldn’t you expect that from homes built 100 years apart? 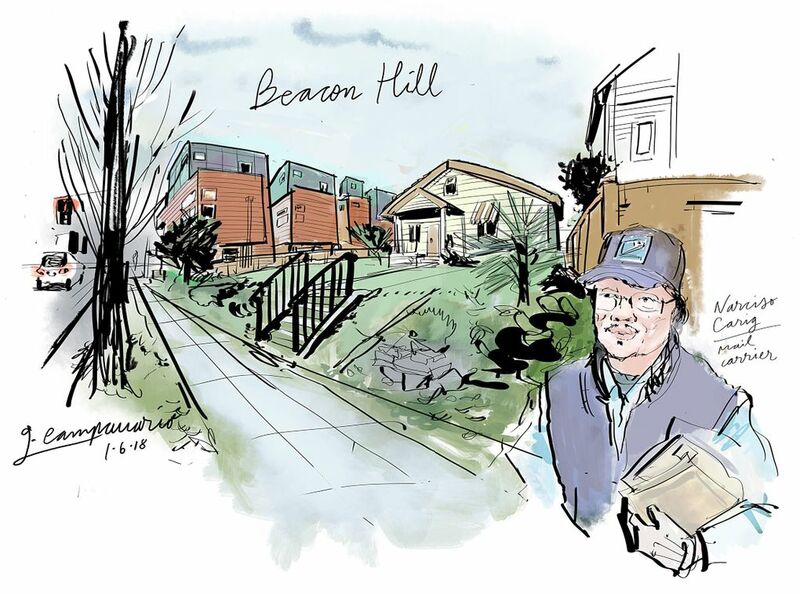 As Seattle flips the switch to upzone neighborhoods and becomes denser in general, our residential landscape is changing faster than it has in decades. Porches and front yards are out, private rooftops are in. Siding textures are out, sleek surfaces are in. Color schemes, for the most part, are brighter. McUrbanism, SimCityism (I love SimCity!) and Developer Modern are some of the terms I’ve seen used to refer to this style of angular residences with flat colored panels. And it seems to be popping up throughout the city. It’s easy to turn our noses up at these homes now, but who’s to say they won’t be looked at with nostalgia in a hundred years? 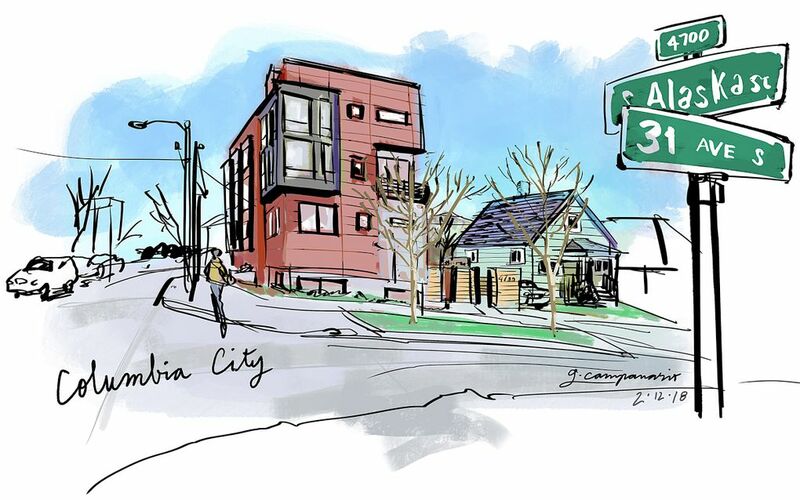 Below are a few more sketches showcasing the contrast between old and new Seattle residential architecture in other neighborhoods.